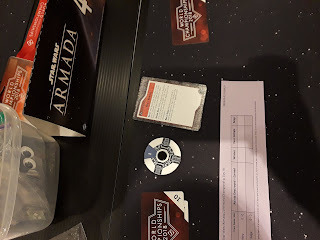 In case you haven't read my article on what I was bringing to worlds, and what I planned to do with it, read that first. It's time for Worlds, the best time of the year! I was running a Raddus build, modeled off both my crazy ideas and Truthiness's crazy ideas. With that much list building skill, we'll do just fine! I took first player, and chose his most wanted. He selected my flagship and his Gozanti, and we were off to the races! He deployed his Quasar Fire way to the right, and his flagship way to the left. I had to decide to either go after the flagship first or hit the Quasar first and curl him up. I figured the Quasar was going to be doing the most squadron activations, and they were my biggest threat, so I dropped in on the Quasar on Turn 2. 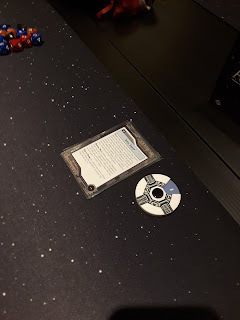 Things went very well for me initially, dropping the Quasar, then the Gozanti (just ramming it to death to stay out of range of some nasty Demo side arcs. However, Demo and the Arquitens continued to activate squadrons. I lost one of my CR90s taking the Arquitens out, and my Liberty was on the ropes. With just a few hull left on turn 5, Gamma wiffed a crucial attack, and the Liberty was away and not going to be attacked with 1 hull remaining. Demo had engine teched to try and get into range of Jendon to relay to Maarek and finish him off... but found himself just out of range. Turning a 6-5 loss for me into a 7-4 win. Not a spectacular start, but I'll take it. 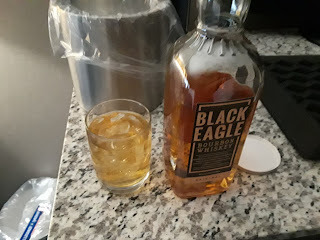 My second round was yet another Sloane list. I did not get the full list, but it had a 378 point bid, an ISD Kuat Avenger with Vader (boarding team) and a Quasar Fire / Gozanti for pushing squadrons. This game really hammered home that Intel Sweep was the weakest link in my objective chain, as I would find everyone that took first against me picking it. The I lined my 2 CR90s on the Right flank to cut in against the enemy fleet, and set up a wall of protective rocks to help shield my transport while it collected the objective tokens. Oh, the Quasar Fire had Brunson. Whoops. 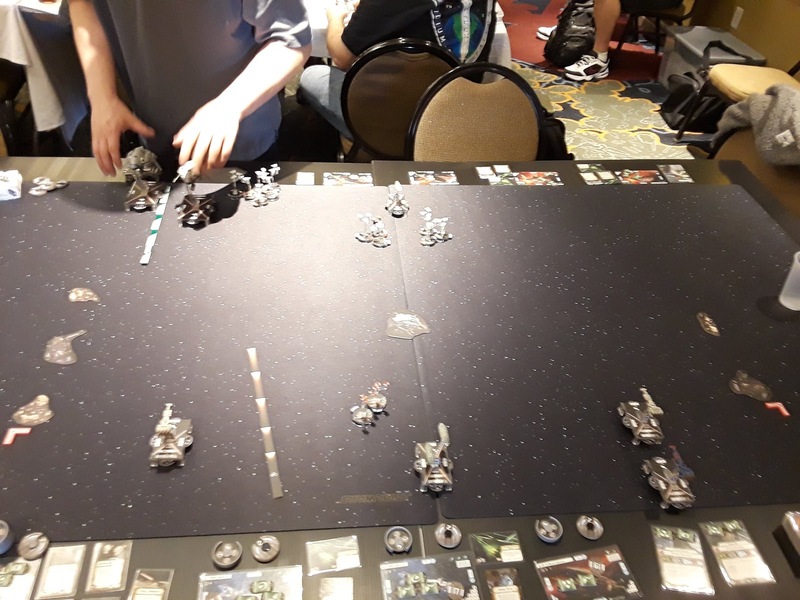 The ISD had Price and chose to Price on Turn 2, rather than Turn 1. 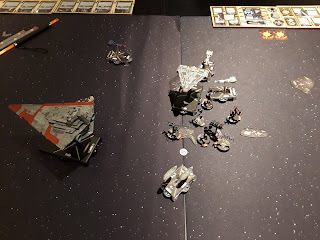 After the game, my opponent stated that he considered doing it Turn 1 to decide where he wanted to swing his ISD, but decided to do it on Turn 2 to try and avoid a Turn 2 Raddus drop. It worked, as I dropped Raddus on Turn 3. I wish I had gotten a picture of the Raddus drop, but I placed it in such a way that it was forking the ISD and Quasar, and trapping the Quasar in place. My hope was to save my Flagship which had gotten into medium range of the ISD thanks to Price, and a solid medium range hit plus fighter support might have been enough to take it out. As expected, he activated the Quasar first, and I was able to run my flagship away from the ISD. I assumed at this point that I would be able to handle a side arc of the Kuat, as I had 5 front shields, and 4 hull. He'd have to get 9 damage on 6 dice (1/1/4 with External Racks). Sure enough, he rolled 8 damage without the need to reroll anything. I flipped a structural damage. No more Liberty. That would seal the deal, as my CR90s would just not have the damage output available to deal with a Brunson equipped Quasar that was hanging at the station / obstacles. 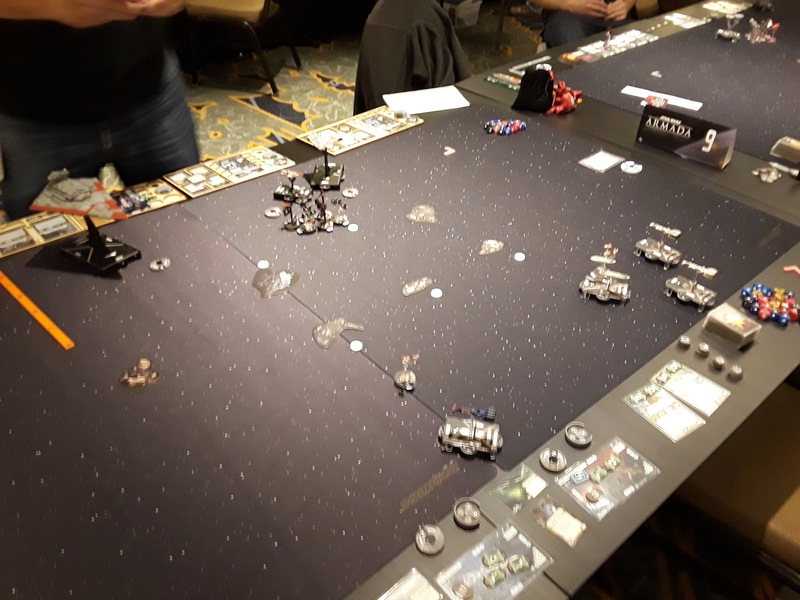 It was an even worse swing than you might think - my Liberty was likely doomed, but without the Quasar, which was his 90-something point flagship, he was also able to use it to keep squadrons on my transports, blowing them up before they could get Token #3, swinging 75 points to him. He then worked over my CR90s, completing the route and giving him a 1-10 Win over me. This put me at 8 points, and more or less eliminated me from contention. 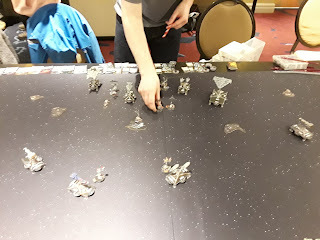 Round 3 was against one of the most enthusiastic opponents I have ever played. 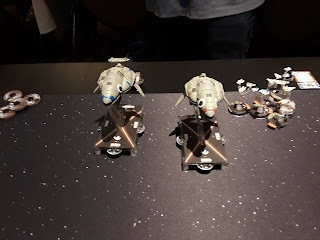 He had decided to go all in on Ackbar Assault Frigates with A-Wings. This one would go quite a bit better for me. We set the rocks way off to either side to have a wide open field to play in... then he deployed his AF's off to one side to hid them behind the rocks. Sneaky. Raddus jumped in on Turn 2, and ate an Assault Frigate. At the start of Turn 3, he ate the other. Without ECMs or any other defensive retrofit equipped, the Assault Frigates just didn't have enough defensive options to stop Raddus, who was able to get the critical effects and accuracies he needed to lock both tokens down, and drill sufficient damage into their hull, ramming for whatever was left over. This would give me 384 MOV, losing Tycho, and that would eventually come into play for tiebreakers. We also wound up taking things from one another. I accidentally wound up with his rocks, while he took my turn dial. All items were successfully returned. 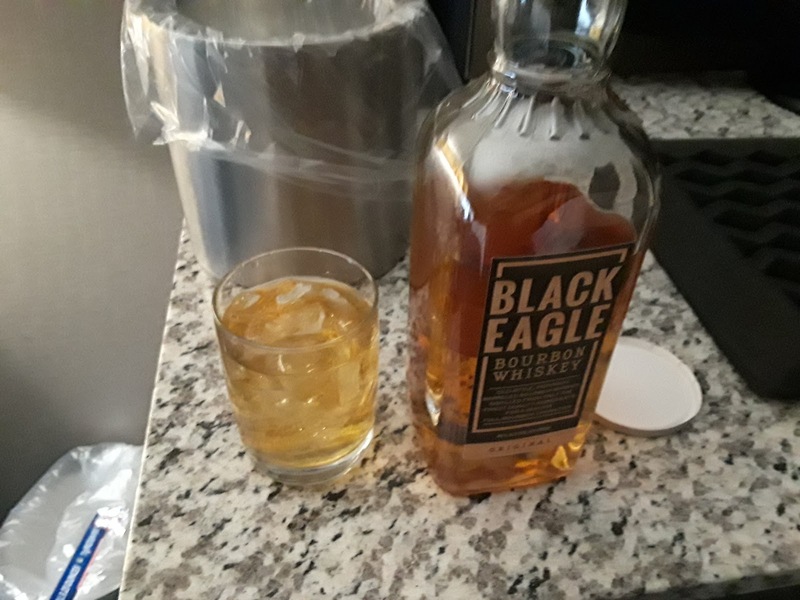 No pictures of Round 4 were taken, but upon learning that there was no split that could put me into the top 2, I decided to commence Operation: Day Drink. I was looking forward to playing Geek19, as he and I were tied in score, but sadly he got matched up with the other 18 point player, and I got bumped down to play one of the 17s. Told you this was important. My 4th round opponent was one that I had played at Nationals, and he was eager for a rematch. He had a Dodonna list, built around putting critical hits onto my ships. 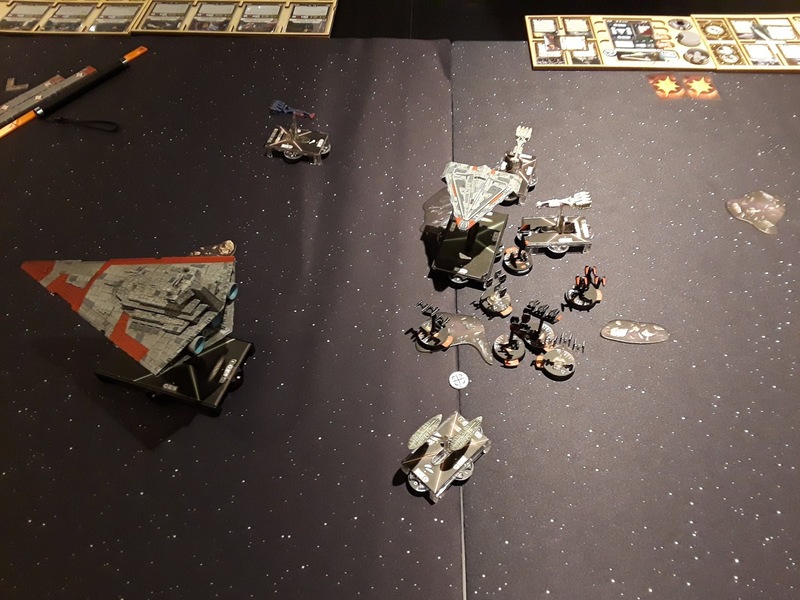 Stuff happened, and he wound up edging me out by getting his objective ship over to grab the last two objectives while I couldn't wheel my Liberty around to get it. That 75 points swung it to a 6-5 win for him. Amusingly enough, due to tournament score, he had been 1 point below me, but my one 10 pt win was enough MOV to get a tiebreaker over all the other 23 point players, putting me into 15th on the day. I also learned some Dodonna favorable rulings for critical effects. 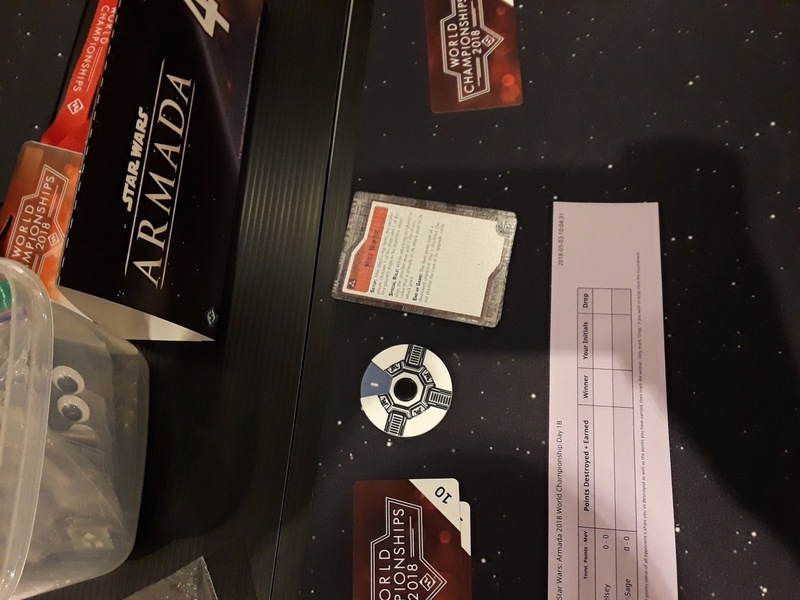 Per Worlds rulings, Dodonna doesn't let the defending player look at the 4 critical cards handed to the Dodonna player for selection. 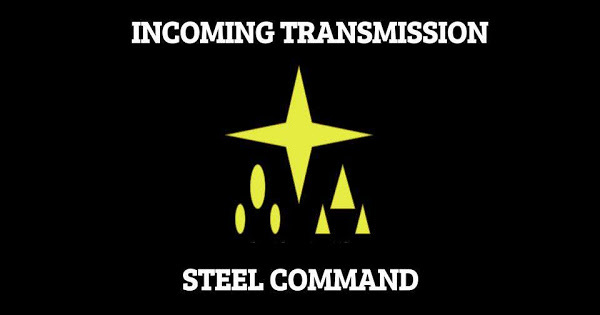 Also, when defending, if you redirect you must pick the hull zone you are redirecting to before the critical effect is declared (and if APT, the card is flipped). RAW seems to support these interpretations, no matter how much I might personally dislike them. I also repaired a face down damage card, and it was argued it should be discarded randomly. I don't believe that is supported in the rules. While the cards are flipped face down, when you repair you are allowed to select your damage card, and if you kept track of which one was - for example - a structural, you should be able to select that specific card. Overall, I had a great time playing in Day 1B. I'll write another article on Worlds Wrap Up, which will be our 400th article! Keep your eyes open for that! Nice write up and a really tough break.